November 2013 marks 25 years since the founding of the National Center for Biotechnology Information (NCBI). 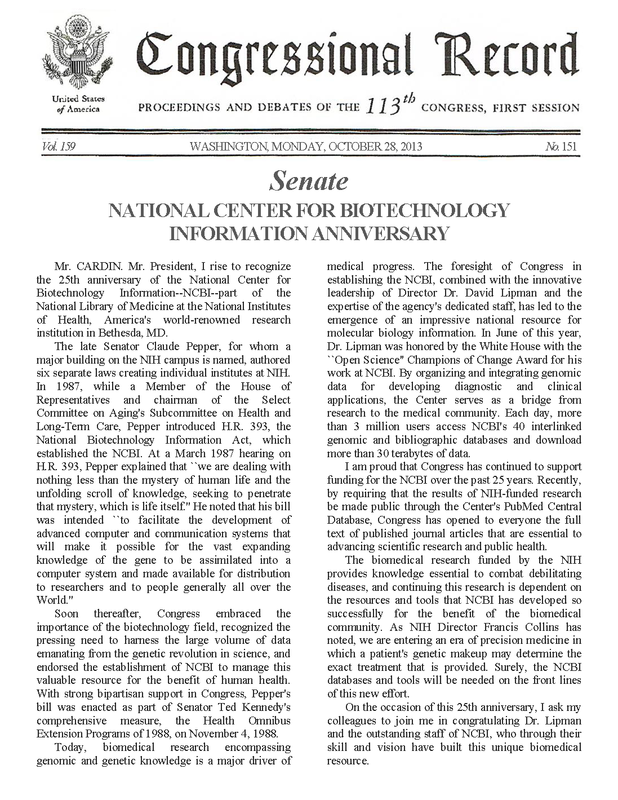 In honor of NCBI’s 25th anniversary, United States Senator Ben Cardin read a statement into the Congressional Record recognizing years of service in providing access to biomedical and genomic information to enhance the world’s science and health. On November 1st an awards and recognition program was held on the NIH Campus in Bethesda, Maryland to commemorate this occasion. Tony Hey, Ph.D., Vice President of Microsoft Research, presenting the Jim Gray eScience award to David Lipman, M.D., Director of the NCBI. At this event, Tony Hey, PhD, Vice President of Microsoft Research, presented NCBI Director David Lipman, MD, with the Jim Gray eScience Award which recognizes researchers who have made outstanding contributions to the field of data-intensive computing in the pursuit of open, supportive, and collaborative research models. For more information, see this Microsoft Research Connections Blog post. 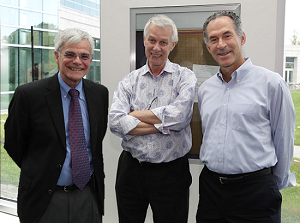 Michael Gottesman, M.D., NIH Deputy Director for Intramural Research, Sir Richard Roberts, Ph.D., Chief Scientific Officer of New England Biolabs and David Lipman, M.D., Director of the NCBI. Dr. Lipman closed the event by recognizing the dedicated and hard-working staff of NCBI who have enabled the progress that has transpired over the last 25 years. Established in 1988 as a division of the National Library of Medicine (NLM) at the National Institutes of Health (NIH), NCBI has grown into a leading source for public biomedical databases, software tools for analyzing molecular and genomic data, and research in computational biology. NCBI’s resources rank among the most heavily used government websites in the U.S., with approximately three million users every day. This entry was posted in What's New and tagged 25th anniversary, escience award by NCBI Staff. Bookmark the permalink.